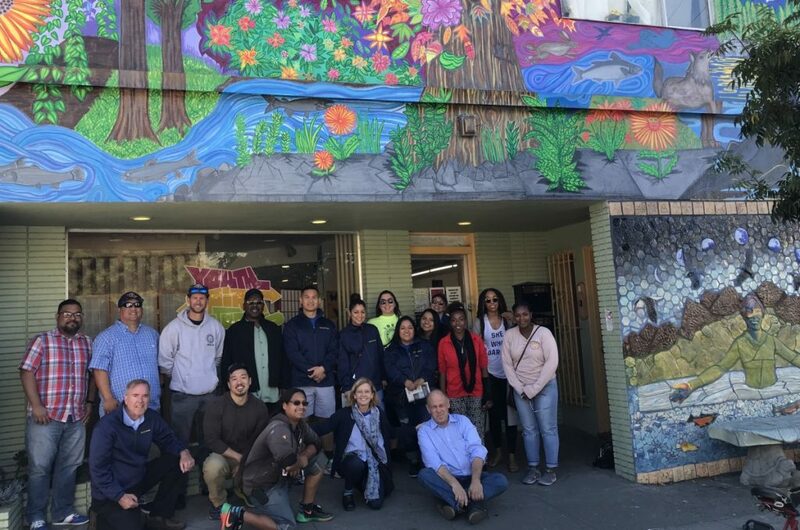 On Tuesday, October 30, 2018, 15 organizing stewards and prospects in the Bay Area joined the Organizing team and IBEW 1245 Business Manager Tom Dalzell for a morning field trip to Youth Spirit Artworks in Berkeley, CA. 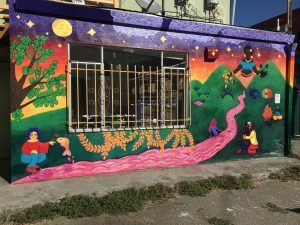 YSA is a nonprofit organization that uses art as a vehicle for healing and transformation, with a focus on homeless and low-income youth in the East Bay between the ages of 16-25. The organization carries out work through fine art, community art, art sales and community organizing. YSA Executive Director Sally Hindman describe how they used art for organizing around a pesticide use issue. They did not expect to win this campaign, but the art captured mass media attention which helped propel the campaign to victory. We also got to hear from Angel Jesus Perez, Sr., and artist who came from Washington, D.C to Berkeley to finish his education and ended up at YSA. 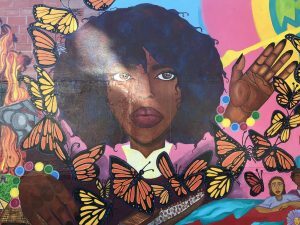 Now he is an experienced artist who carries out most of the community murals in the area. He talked to us about the process of doing murals and his inspiration. The organization is also hoping to kick off their 25-unit tiny house village for transitional age youth in partnership with a non-profit developer in the East Bay. The day concluded with a tour of the art gallery, a peak at the model tiny house in the backyard, and a tour of community murals on Alcatraz Ave. It was a great day, and everyone enjoyed the visit and left inspired by the art and the work that YSA is doing in the local community. Business Manager Tom Dalzell expressed his desire to get Local 1245 involved with the organization, with our members potentially assisting with some of the solar installations at the tiny house village.